I have reached that point - I think I am ready for spring. I have been shopping around for some new spring clothes, and I am ready to wear sandals again. As much as I love winter and wearing chunky sweaters and boots, I am ready for some spring sweaters and lighter jeans (like these). 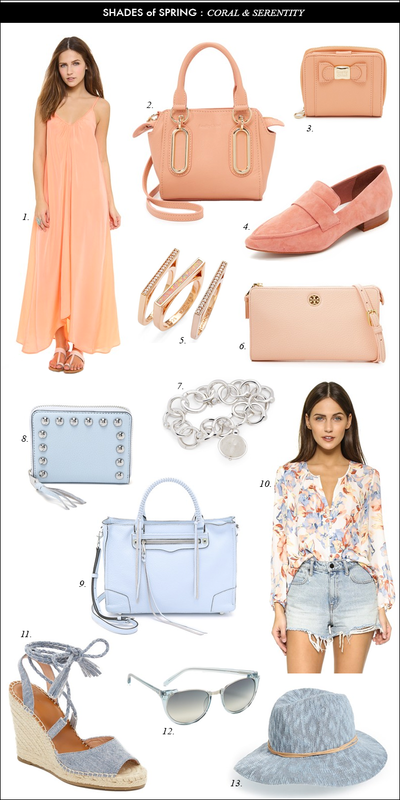 In putting together today’s style collage, I chose the coral and blue because I think they look like spring - and the blue reminds me of being at the beach. For spring, I have been looking for a new handbag. I am probably going to get a smaller bag - not one of the mini bags - although, I think they are pretty cute. I am strongly considering a RED bag, like these, but I do love the blue and blush options. Thoughts? Which color would you pick? 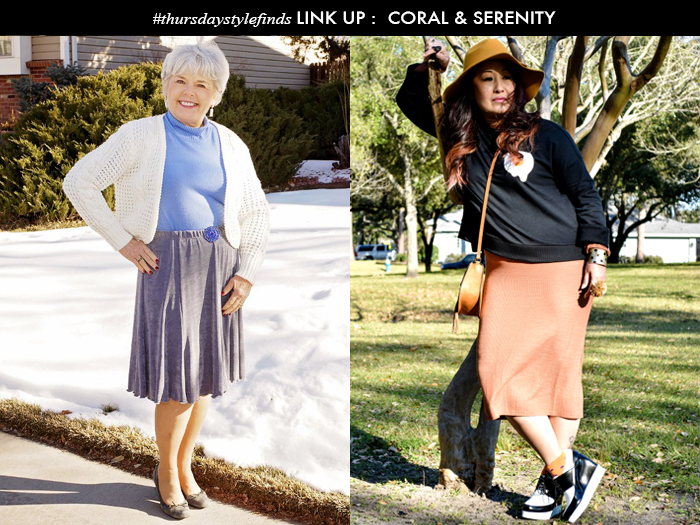 Thank you to everyone that joined me last week for my link up! In keeping with my coral and serenity theme, I picked two looks in those colors. I have Nancy from Jodie's Touch of Style and Sheela from Sheela Writes. Serenity is such a GORGEOUS color! Love the bag you picked! Thanks, Laura! That color has such a calming effect. Dying over those loafers and that gorgeous floral top! Loving these shades! You picked great pieces. I am in love with the blush color, but the powder blue needs to grow on me a little... but, I love the blue items you have shared here! That dress, to die for! So stinkin' cute! Thanks, Sarah. It would be perfect for a beach vacation - which I am longing for right now! I love your picks! That coral See by Chloe bag is gorgeous! Blush is so in for spring! I love the Espadrille Sandals that look like denim. Perfect for Calgary where we have a week of denim wearing during stampede every year! Yahoo! Thanks, Christy. Those sandals were one of my favorites. As a blonde, these are my colors!! Love spring. That dress. That floral shirt. That blue bag. Oh this is not helping the "no spend" challenge. Gorgeous picks. Thanks, Abbie. I know it is so hard not to want to shop all the time. I adore Joie shoes and soft tops!! Beautiful options that make me thing SPRING!! I love the items you picked in the colors you picked! The flats are a little too pointy for my tastes! But I really REALLY like the Tory Burch wallet! And that dress is such a pretty color! Thanks, Sheila. Those shoes are pointy. I'm ready for spring too. I love the floral top! I would definitely go with a blush bag, but since pink is my favorite color, I'm biased! Thanks, Lana. Bring on the warm weather! You are welcome - she was wearing such a pretty color of blue - perfect for my post. Thanks for linking up! I have that maxi in a different color and love it so much I might need this color too! Thanks! It is a pretty good price too. I love the coral pieces you selected! It is such a pretty color that works for the spring time but also with all black for a pop of color. Thanks, Chelsea. I like it paired with black. Beautiful post. So glad to see femininity in fashion for spring. Lovely theme :-) Those style picks are fabulous! What a great collection! Makes me dream of warmer weather. I've got a few of these items on my wish list now! I love coral!! The Kendra Scott rings and the Rebecca Minkoff bag are my favorite. Makes me long for warmer weather, too! Thanks, Joy. You are so welcome! Thanks for linking up. I loved your shoes in that post, too. This is such a pretty roundup! I'm loving that floral blouse and the espadrille sandals! Oh I honestly love these colours so much. I think the serenity floral blouse is my favourite! I love these colors for color of the year, both are just so feminine. Thanks, Alice. I will definitely stop by your linkup. So much good pieces here! Those are def the perfect colors for spring. Love the espadrilles. Please pin this inspo on my linkup tomorrow! I love your coral and serenity picks! I especially love the pink loafers and the gorgeous blue handbag. I just picked up a new pair of earrings in that pretty coral color--they're making me ready for spring too! I'm with you! As much as I like those thick and soft sweaters, I am very much ready to trade them in for lighter layers. Have a great weekend! Thanks, Bogi. Have a great weekend! Thanks! I agree - I really like the colors this year. I love your picks! Both of those colors are my favorite because their so feminine and pretty!